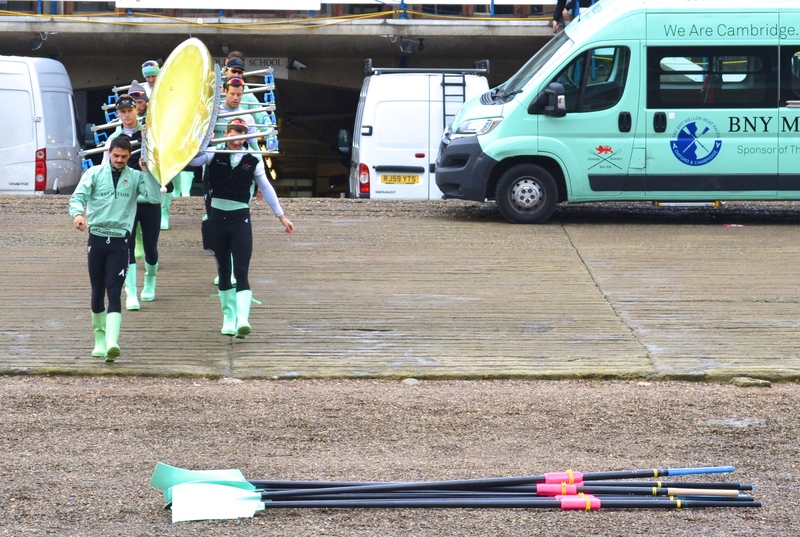 Blondie, Cambridge Women’s Reserves, boat out of Thames Rowing Club. 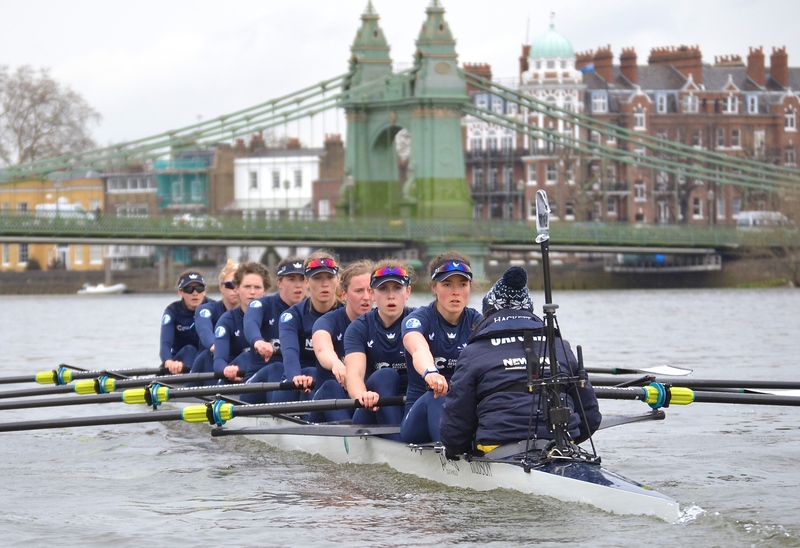 With three days to go before Boat Race Day, the press launch followed the Cambridge men in the morning and the Oxford women in the afternoon. The weather was pleasant enough for the first outing but wet and windy for the second. However, poor conditions are probably better preparation for race day as the forecast for Sunday is heavy rain and 18 mile per hour winds with a temperature of 11C/52F. Thankfully, the race is not on Saturday when 40 mile per hour winds are forecast between 2pm and 5pm. 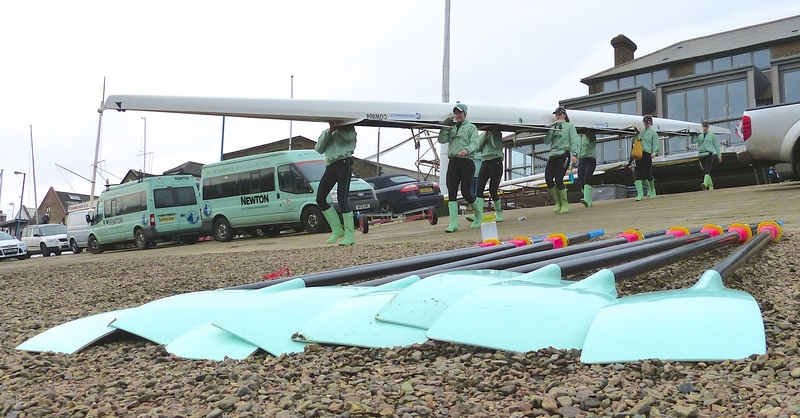 The Cambridge Men’s Blue Boat goes afloat from the King’s College School, Wimbledon boathouse at Putney. 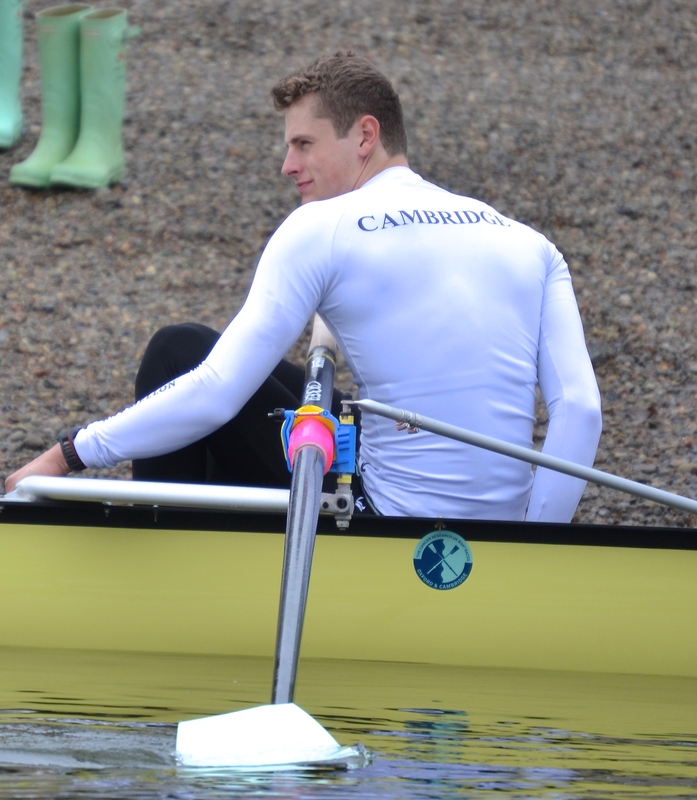 Charlie Fisher, number 3, took up rowing after deciding he wasn’t good at other sports. 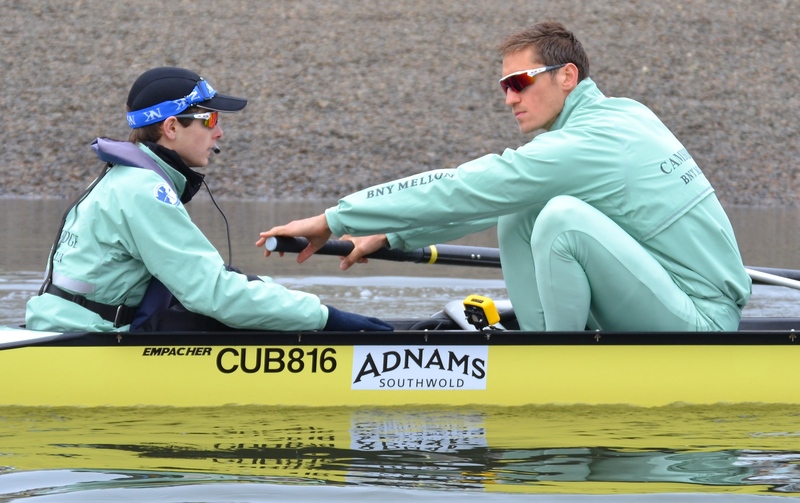 Cox Ian Middleton, in his third Boat Race, and stroke man, Lance Tredell, in his first. 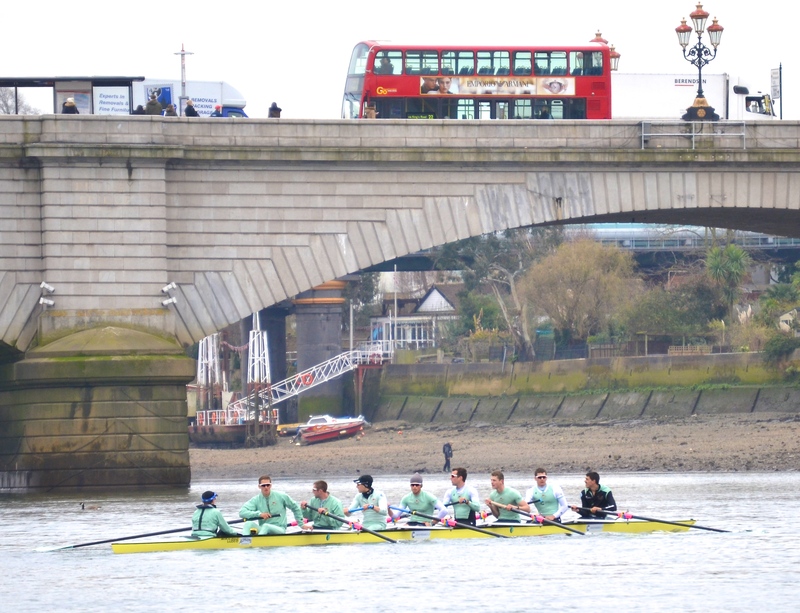 It is compulsory to wait for a London Bus to pass overhead before taking a picture of a crew under a bridge – Putney Bridge and a number 93 in this case. 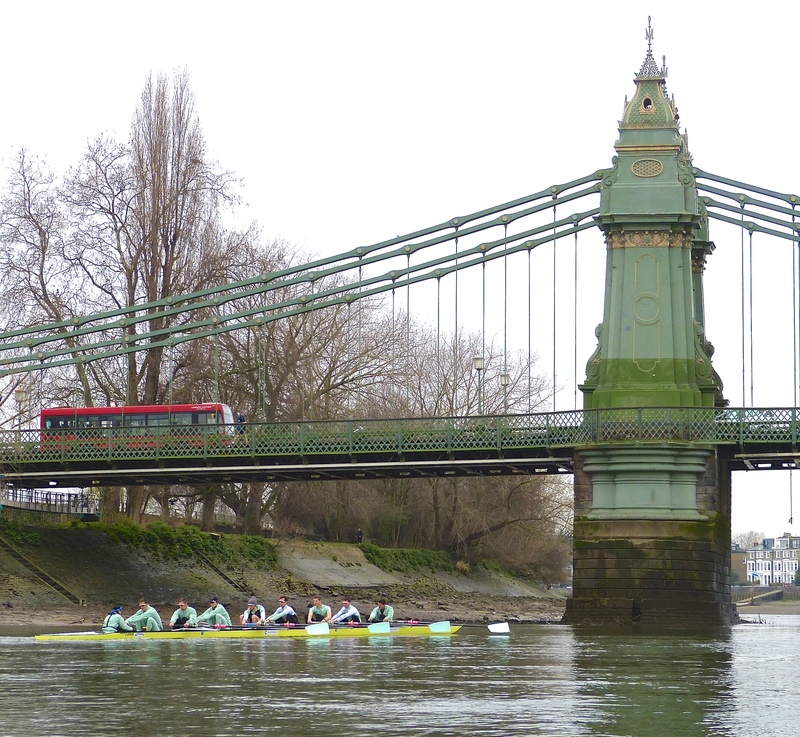 Downstream of Hammersmith Bridge. In the race, this point marks 40% of the distance to be covered. 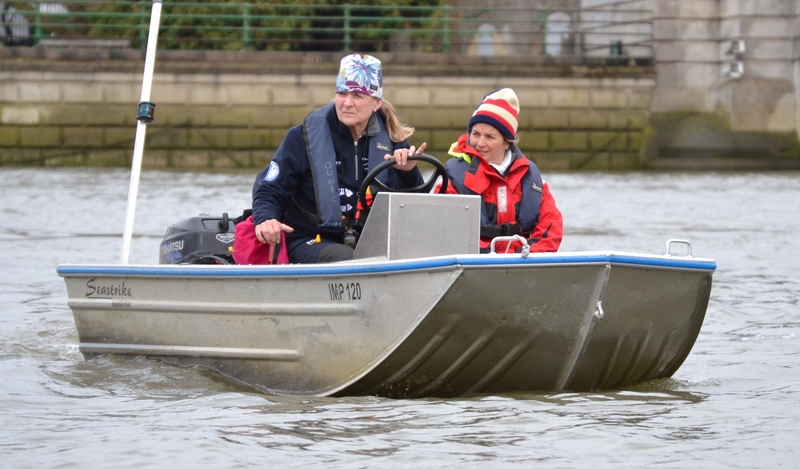 The return journey – upstream of Hammersmith. Passing Harrods Repository, nowadays luxury flats. In the past, the two flagpoles each had a dark blue or a light blue flag which was raised or lowered to show the respective positions of the crews. Passing Fulham Football Ground, coach Trapmore does some fine tuning. 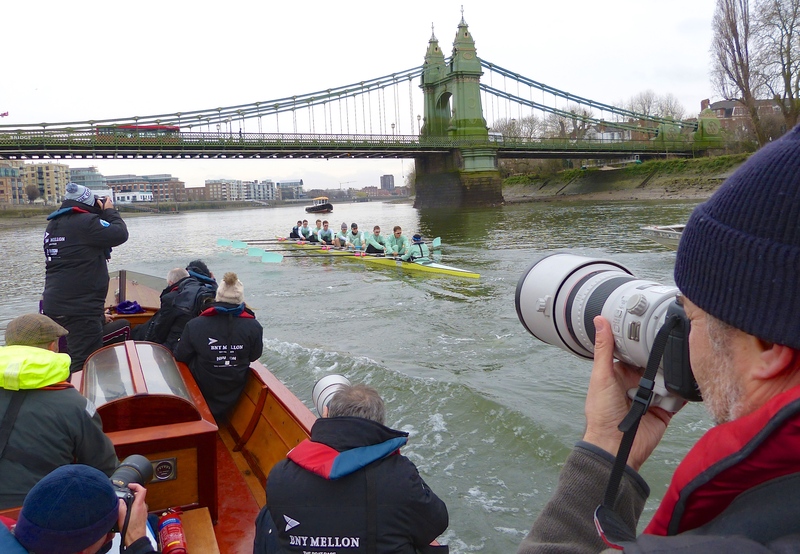 A study in concentration, OUWBC approach Hammersmith Bridge. 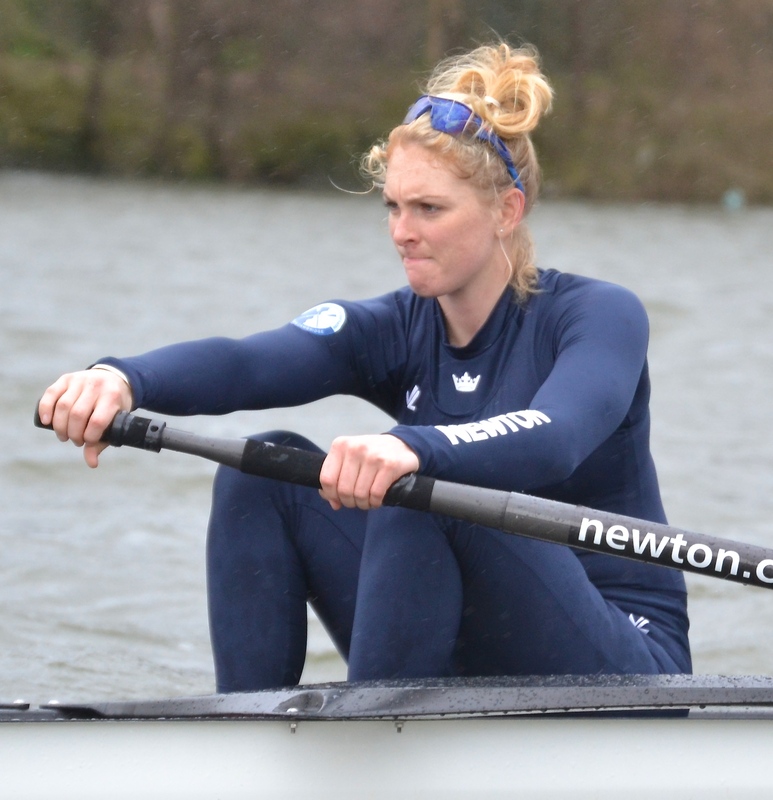 Christine Wilson, now in her fourth year of coaching the Oxford women, will be looking to keep her 100% winning record. Stroke Lauren Kedar. The crew has a long layback at the finish. 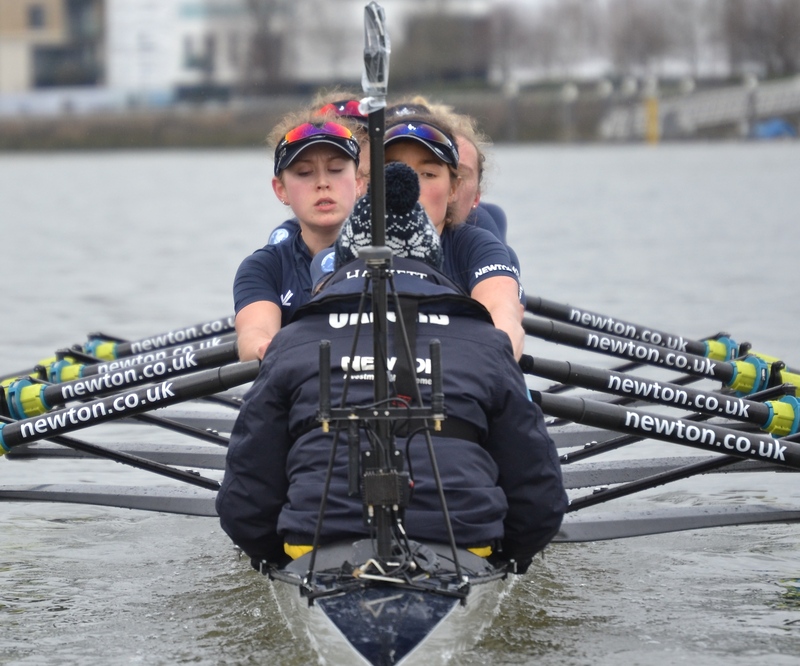 The view the crew hopes to show to the Cambridge cox. 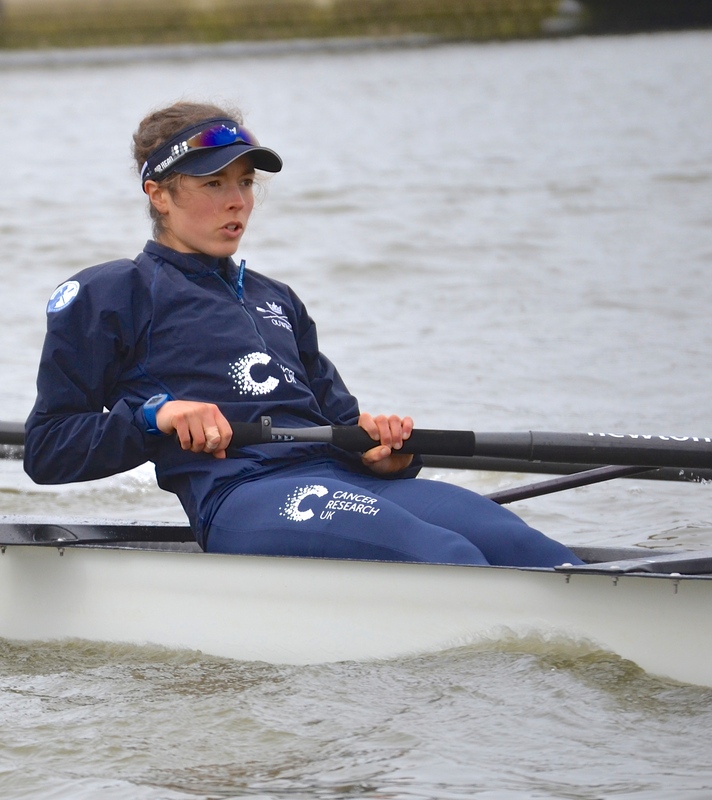 Emma Spruce, number 2, gets serious. 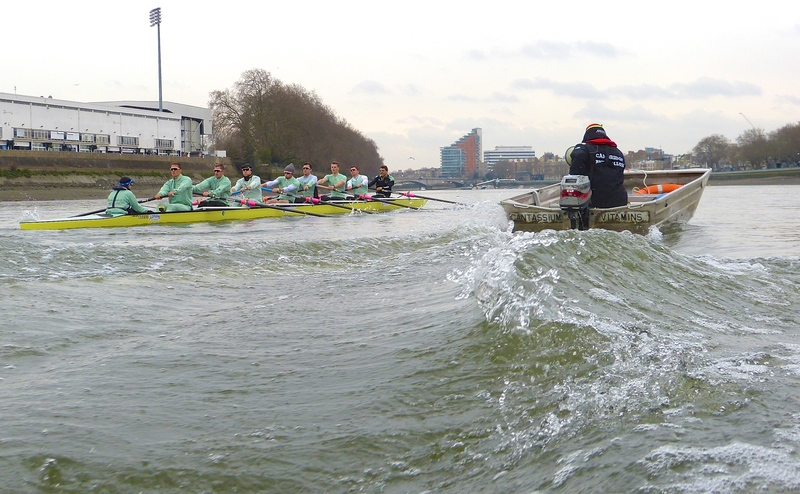 If anywhere on the Putney to Mortlake Course is going to be rough, it is usually Corney Reach at Chiswick. 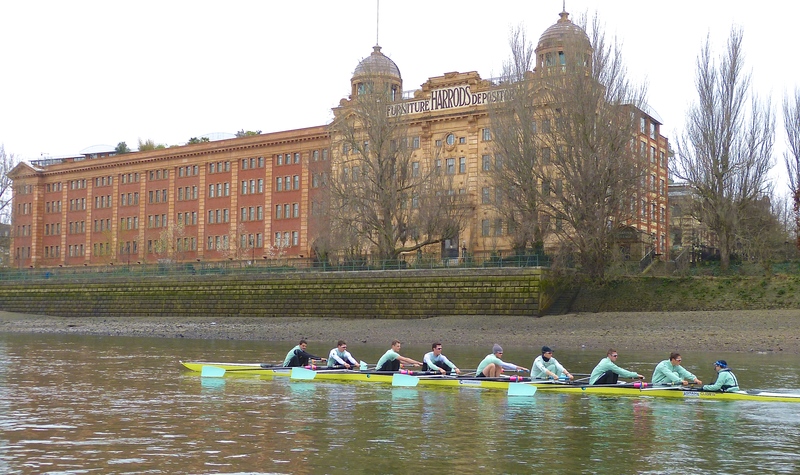 The finish, downstream of Chiswick Bridge. The finish post on the right is a replacement for the one that broke off at the base in the winter. 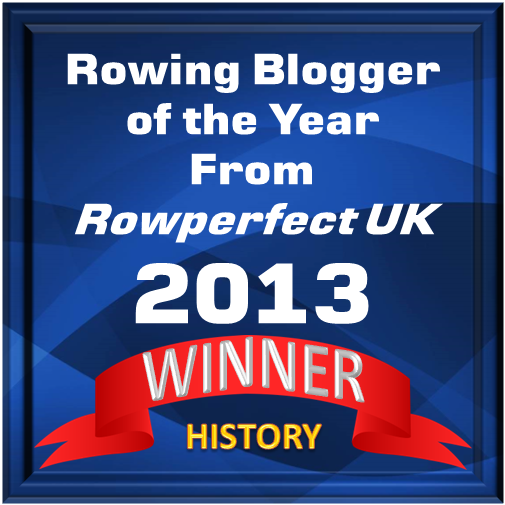 It does not follow the legend that the colour at the top is that of the last winner of the men’s race. Cambridge clearly hope that it will be correct in a few days time.